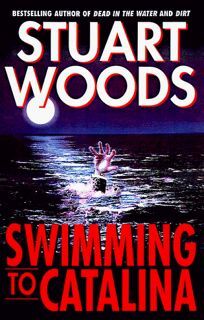 Formerly a cop and now a lawyer, Stone Barrington is plummeting to the bottom of the ocean with an anchor chained to his waist at the start of Woods's 17th novel (after Dead in the Water, 1997), a smoothly presented if slight thriller that ambles pleasurably through a kidnapping plot involving Barrington's ex-lover (improbably named Arrington). Her husband, actor Vance Calder, flies Barrington out to Hollywood to help find her. In L.A., Barrington goes from flavor-of-the-minute to persona non grata in less time than it takes a flop to disappear from a multiplex. Naturally he's suspicious, so he starts investigating on his own and finds links aplenty among Calder, a mobster named Onofrio Ippolito (head of the Safe Harbor Bank) and labor fixer David Sturmach. The plot moves quickly and is full of dialogue and genial if unsurprising gibes at self-centered stars. Unsurprising is the key word here. Neither the mystery nor the romantic subplot contributes much in the way of suspense to this pleasant, inoffensive airplane read. $250,000 ad/promo; BOMC alternate. (May) FYI: HarperPaperbacks is issuing a paper edition of Dead in the Water simultaneously with Swimming to Catalina.